When I was offered a chance to try out the Dyson Cordless Vacuum DC59 I was actually very excited despite the fact that I do not like vacuuming. I usually make my husband do the vacuuming partly because I can never be bothered to lug it around the house and have to mess around with the plugs in every room and also because I am always annoyed at what it doesn’t pick up. The Dyson DC59 seemed like the perfect solution for someone like me: extremely portable, no messing around plugging it in and its excellent cleaning power. It looked perfect and when it arrived I’m not ashamed to admit I unwrapped it like a kid at Christmas! As vacuums go it is very pretty, almost all our visitors have commented on it and had to have a test drive too, other people doing your housework for you is surely a bonus! It was so easy to unpack and put together, it can’t have taken me longer than a few minutes to have it up and running. The Dyson was already charged so I just slotted the parts together and that was it. Once I set it off I couldn’t stop and started vacuuming every corner of the house. It picks up the dust like no other vacuum I have owned; in fact I was horrified to see how much it picked up from our rug that had only been cleaned a few days before. The main motorised head has carbon fibre filaments so it will remove fine dust from hard floors. It comes with three extra attachments; a mini version of the main head, a combination tool and a long nozzle. These are all simple to interchange and slot into the main wand easily. 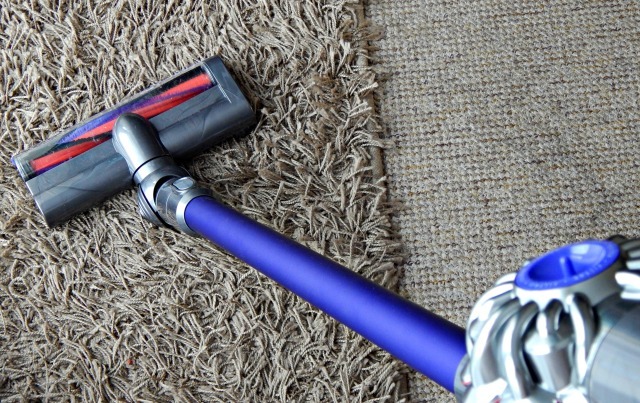 The vacuum can be used with the long wand to clean floors or you can attach the tools directly to the main body to make a smart little handheld vacuum. We found this perfect for use in the car and I think I would also use it on the stairs in the future. The vacuum is so versatile and there are still things that I’m discovering I can use it for; the mini version of the main head is great for cleaning the sofas and stairs. The long tool is good for getting behind furniture and just today I discovered I could have a quick sweep round the twins high chairs after lunchtime. I’ve used the combination tool to run along the skirting boards and to reach up and catch some cobwebs that I’ve been unable to get to. It has all the features you would expect from a Dyson: great cleaning power and suction and a bagless collecting system. 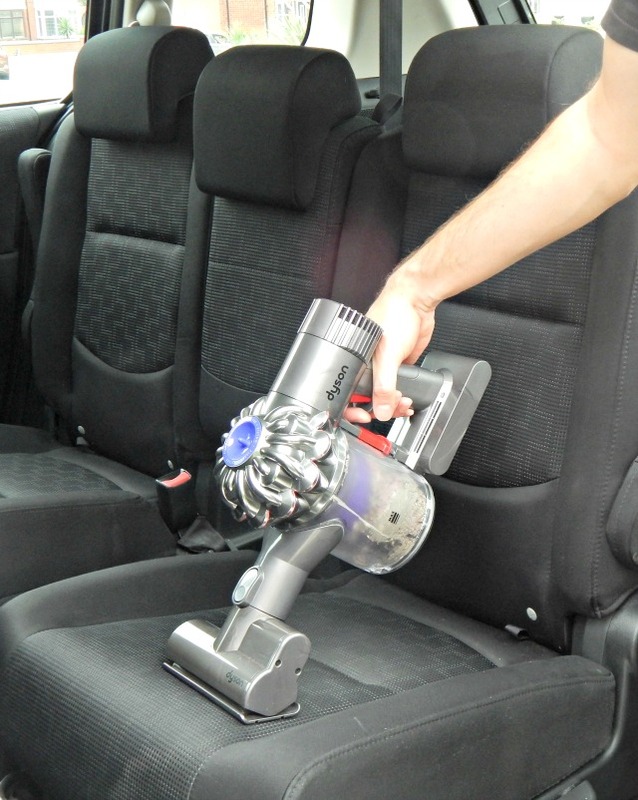 Of course with a smaller vacuum the compartment for storing the dust is smaller. When I first cleaned with it I had to empty it quite regularly but now I’m just doing quick blasts here and there I’m not emptying it quite as often. Even then the process of emptying the cylinder is really simple and takes no time at all; you just pull a red release button by the power trigger and it pops the bottom of the cylinder open, empty it into a bin bag, pop it back in and you’re ready to clean again. By far and away my favourite thing about this Dyson is that it is cordless. When I told a few people I was trying it out I think they thought it was a bit of a gimmick but I have been quick to reassure them…this is the future! The fact I can just grab it and clean is just amazing to me, there is no messing around swapping over plugs or having to switch to a different socket in every room. This has made the biggest difference to my housework as I am able to just pick it up and clean as it’s needed. It is perfect for a house with three little ones; there is constantly food being spilt, dirt being brought in and now I can clean it easily as I spot it. It’s fantastic for when I’m baking with Lucas, of course he always spills flour on the floor and now I quickly clean it up before he has chance to step in it and traipse it though the house. The vacuum has about 20 minutes of charge in it but because it is powered by a trigger you really only use the battery when it is needed. We have quite a small house so I find I can do the whole of the downstairs in one charge after which I can plug it in so it is ready for the next time it’s needed. Let’s face it, I very rarely get longer than 20 minutes to clean anyway so the timing it brilliant for us. 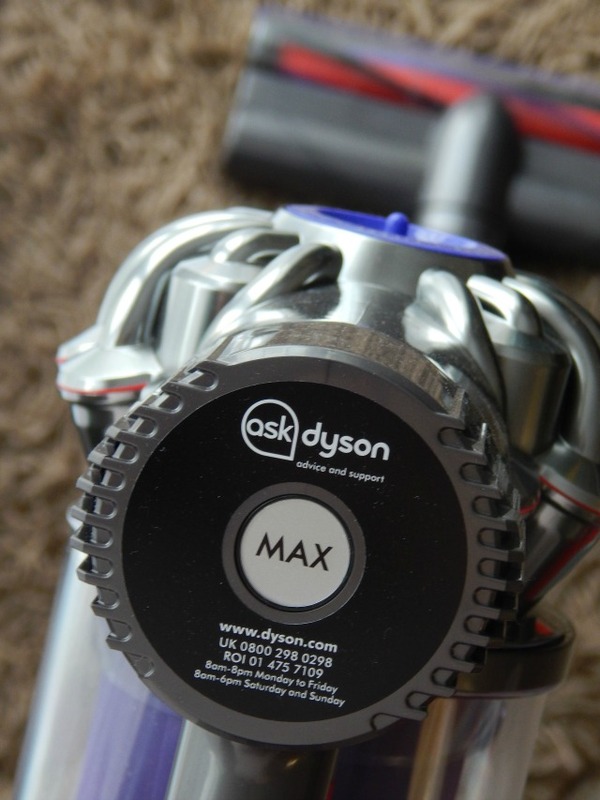 The vacuum also comes with a mount that you can attach to the wall to easily hang up and store the Dyson DC59. We are currently deciding on the best position for ours and again this is something that makes it easier to store and use. It takes up such little space which makes it a great addition to our small family home. I couldn’t really ask for much more in a vacuum cleaner; cordless and portable, simple to use, great cleaning power, versatile and space-saving. Added to that I personally think it looks pretty cool and we’ve been using it for about a fortnight and I can’t fault in on anything. 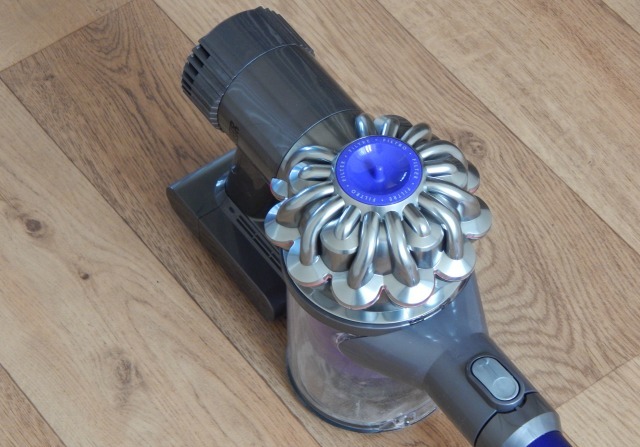 Although it is small we definitely wouldn’t need another vacuum alongside it; the Dyson does everything we need it to and it has very nearly made the housework a pleasure! 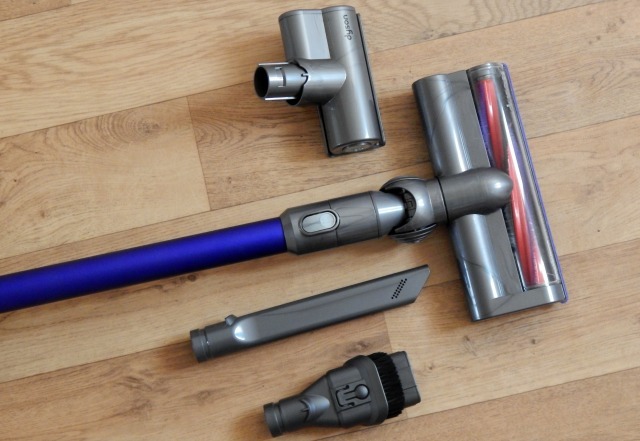 To find out more about the Dyson Digital Slim range please click here or if you would like to see further reviews of the Dyson DC59 read more here. Disclaimer – I was sent the Dyson DC59 Cordless Vaccum for review. All thoughts and opinions are my own. Love love love my Dyson too! I have the larger ball one but totally looking into this smaller one now too! wow didnt realise that Dyson did a cordless version! .. how cool that is all used from one main unit!